Chicago Sketch Seminar 2019 will be held in Chicago on May 31 – June 2, 2019. Seminar is an annual educational event organized by Urban Sketchers Chicago. The goal of Seminar to celebrate and practice the art of on-location sketching in our beautiful and artful city - Chicago. We hope to bring a Symposium-like experience, on a much smaller scale, to our chapter and our friends from other locations. Seminar offers exciting workshops and opportunities for participants to network and socialize. This year Seminar will offer 18 workshops taught by USk Chicago instructors as well as instructors from the U.S. and Canada. Seminar is designed to help absolute beginners and experienced artists alike develop the sketchbook habit, try new things, and practice sketching in public. Workshops will be taught on the sidewalks and in the parks of Chicago, giving ample opportunity for you to practice sketching the motion of this city. We hope you’ll join us! This is our 5th Seminar. 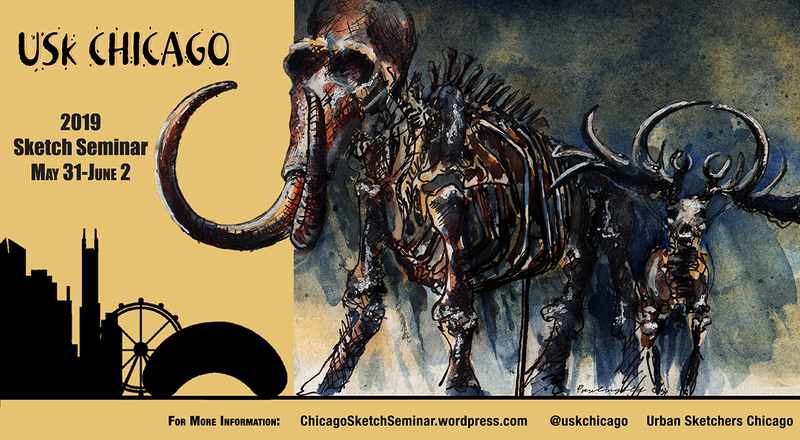 Previous Chicago Sketch Seminars were held in 2014, 2015, 2016 and 2018. 5. Brian Wright & Suzala Zahler — Composition Tells the Story! 8. Jingo de la Rosa — Think with your hands! 13. Mark Jones — Go BOLD with Color Pencils! 15. Paul Heaston — Umbrella Perspective, Chicago Style!